An Oxfam study says unpaid work done by women across the globe accounts for USD 10 trillion a year – 43 times – the annual turnover of Apple Company’s. Recently, Union Minister of Human Resource Development Prakash Javadekar said, “There is a large section of females who by choice don’t apply or don’t work. So, how will we classify that? Will we classify it as unemployment?” The statement clearly didn’t justify the already skewed share of women in the workforce which has fallen from 34.1 per cent in 1999-2000 to 24.2 per cent in 2011-12. There are multiple issues that plague women’s participation in India which includes the sole responsibility for care of household and reproductive work on women, restrictions to their mobility, gender stereotyping of occupations among various issues. In the words of American political activist Angela Davis, ‘women are generally responsible for the daily tedium of housework which is ‘invisible, repetitive, exhausting, unproductive and uncreative’. While addressing a session at ‘International Conference for Making Non-Traditional Livelihoods Work for the Marginalised’, Mumbai-based feminist activist and researcher Dr. Nandita Shah, who is a recipient of Nari Shakti Award 2016 said, “Care is one of the biggest issues that doesn’t let women stay in the workforce.” Her statement is not ill-founded. 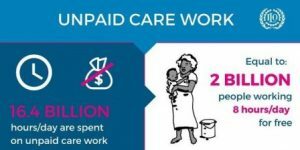 The World Bank’s statistics state that ‘women average 2.6 times as much time on unpaid care and domestic work as men do’. This is especially significant to be discussed in the wake of a recent Oxfam study saying that unpaid work done by women across the globe accounts for USD 10 trillion a year – 43 times – the annual turnover of Apple’s which is a leading company in terms of market value. It also added that in India, the unpaid work done by women is worth 3.1 per cent of the country’s GDP with women spending 312 minutes per day in urban areas and 291 minutes per day in rural areas on such unpaid care work. Delhi Post spoke to a few experts on how significant is unpaid care work by women in the era of multi-tasking, and what limits its economic viability. Also read: Who cares for caregivers? “Women’s economic empowerment help negotiate the power relation at home and help question the practices at home, and get out of violence,” said Poonam Kathuria, Director, SWATI that works with female victims of violence. “We come from large traditional backgrounds but at the same time, we respect women’s traditional work. Most of it is unpaid. If men take over the jobs traditionally done by women, then men get paid better. 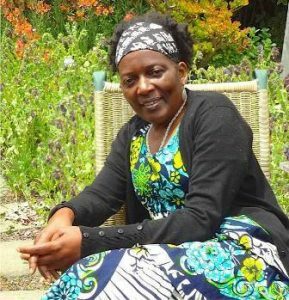 When men taken over care giver’s role, then they are paid but not women,” said feminist activist Hope Chigudu who is also the co-founder of Zimbabwe Women’s Resource Centre and Network, based in the capital city of Harare. She seems to make a point considering that according to the World Economic Forum, The Global Gender Gap Report 2017, women earn 62 per cent of what their male colleagues earn for performing the same work. With 34 per cent gender pay gap, India stands at 108th rank on the World Economic Forum’s (WEF) Global Gender Gap Index of 2018 which is far below the global average, and lags behind neighbours China and Bangladesh. “From a feminist perspective, it is not so much about respect as it is about breaking barriers. So that, we can break these patriarchal thoughts and get over it and do whatever we think we can do. It is about not sitting on the margins. It is not about despising what men do but how women have been treated by society,” Chigudu further told Delhi Post on the sidelines of the First ‘International Conference for Making Non-Traditional Livelihoods Work for the Marginalised’. Even with skills training and education, women often encounter more barriers than men when it comes to rural, informal and traditional economies. According to experts, women’s productive potential “continues to be under-utilised due to the entrenched inequality against women” and the prevalence of gender-based segregations in the job market. “We need to talk about unpaid care work, we need to talk about men as enablers, and the need for collectives so that women have the bargaining power and gain solidarity,” Amrita Gupta, Head of Research at Azad Foundation told Delhi Post. Mohammed Ukasha working with NORSACC, an organisation in Ghana’s Northern Region which engages in community and policy-based work (in Sexual Rights and Reproductive Health, Gender and Governance, Livelihood and Entrepreneurial Development, and Education), expressed that there are gaps that need to be filled through community awareness and mobilisation. “We conducted a research on gender job stereotyping among young people in 2013. It said that parents were influential in determining which job their child was to get into. Therefore, sensitising communities through mass awareness campaigns on radio etc can help the cause,” he said.